Members of the Metro board of directors take a sneak peek ride from the Culver City to downtown Santa Monica stations on the new Expo Line extension on Monday, May 9, 2016. The line opens to the public on May 20, 2016. It’s not every day a new train service rolls out in Los Angeles, so when the Expo Line to Santa Monica opened for the first time on Friday, crowds of people stood in long lines to get onboard for rides that were both free and historic. 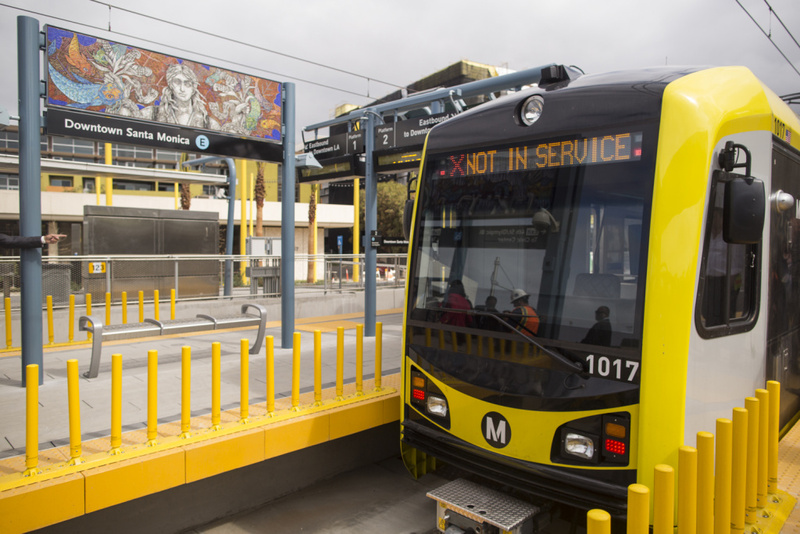 "From the skyline of downtown to the shoreline, this Expo Line connects this city for the first time in 63 years," declared Los Angeles Mayor Eric Garcetti. The last time the rail connected downtown L.A. and Santa Monica was in the days of the old Red Car line. The morning rain clouds gave way to perfect blue skies as the first train with loads of Expo riders arrived in the beach city; they streamed out of brand new light rail cars and many headed toward the shore. The new rail segment opened at noon with free rides for the public through the end of Saturday. Here's everything you need to know before you get on board. Plus, we have tips for how to be a well-behaved transit rider. 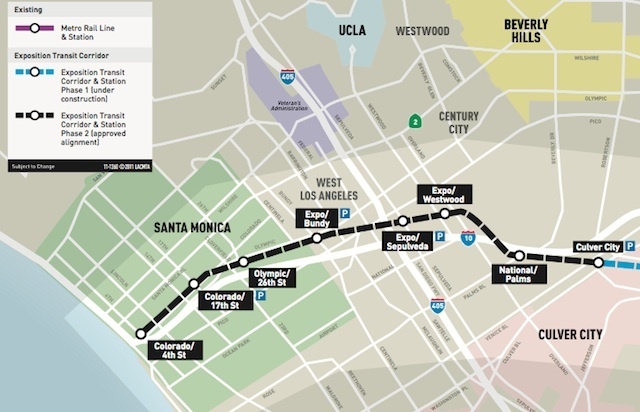 A Metro map shows the course of the Expo Line Phase 2, opening May 20, 2016. Check out our guide to the best sights and dining along the route. All manner of Angelenos came out Friday to take advantage of the opening of the line. "I’ve been waiting for this day for a long time to be able to take one train all the way to the beach!" said Natasha Herald, a mother with three young children. Vasilli Martin remembered taking the old Red Car with his grandmother. "It’s kind of exciting," Martin said. "I wish my grandmother was still around. She’s on my mind today." The Los Angeles Metropolitan Transportation Authority expects large crowds this weekend and projects ridership on the line to more than double in the next 15 years. The first phase of the Expo Line from downtown to Culver City broke ground in 2006, costing $980 million. The newly opening section cost about $1.5 billion, funded by Measure R, the half-cent sales tax approved by L.A. County voters in 2008. While taking a train to the beach has generated much excitement, questions remain about whether city planning efforts and commuting habits will change enough to boost ridership and bring the highest return on Metro's investment. Are you riding the new train? Share your photos with us on Twitter and Instagram @KPCC and use the hashtag #ExpoLine! Love on the rails: Will the Expo extension motivate daters to cast a wider net?